Altecnic, the UK's leading provider of high-quality plumbing and heating products, has announced that its parent company Caleffi has acquired Cristina - an Italian firm working under the trademarks Cristina Rubinetterie and SILFRA that has been producing top-end taps and fittings since 1949. This was a momentous business deal between two entrepreneurs - Marco Caleffi and Alberto Cristina - who go back a long way and have worked together with mutual respect, sharing the same work ethic, business approach and local territory. The two reached a full agreement on all aspects. Commenting on the acquisition, Group Chairman Marco Caleffi said: "I wish to think that now that Cristina has entered the Caleffi Group, the handover will be exceptionally smooth. Cristina belonged to Alberto and to his father before him, so it has always been a priority for him to leave his company to someone he trusts, someone who would ensure that day-to-day running carries on as it always did." He added: "A company is not only made up of processes and products, but also of dedication to the job, local contacts, investments and constant attention. In view of this, having become the Chairman of Cristina is more of a matter of pride to me than a mere business deal. Cristina is a solid brand with an amazing background, a high product positioning and a reputation for innovation and fine design both in Italy and abroad. This is why as a brand Cristina deserves to be guided and steered along a path of progressive growth which will protect its product and brand identity." Daniele Mazzon, newly appointed General Manager of Cristina Srl, explained: "It is our firm intention to keep Cristina's Italian distribution and commercial network separate from Caleffi's. But we are convinced that pooling our strengths to some extent and drawing on Caleffi's well-established logistics network on foreign markets will prove to be an excellent opportunity for Cristina to evolve and explore new openings." The Caleffi Group, which is the Italian heart of an international group active in over 70 countries worldwide, has chosen to diversify, entering the market of taps and fittings to ensure continuity and future growth for the Cristina trademark. It is a binding promise. Alan Sherwin, Managing Director of Altecnic said: "This new group acquisition is very exciting news for the future development of the Cristina brand here in the UK and the product offering and services to its customers." 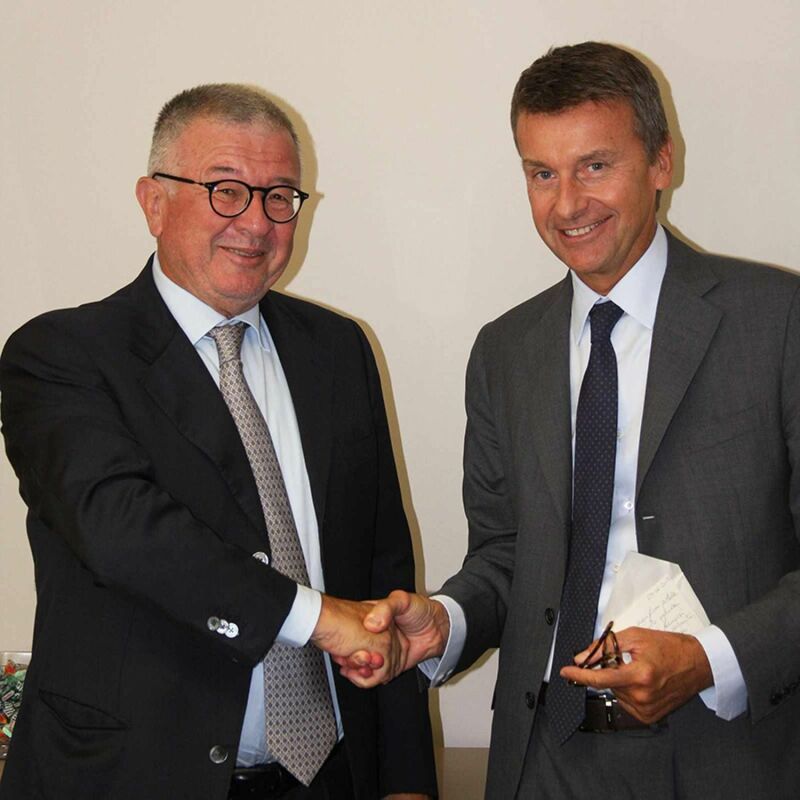 Caption: Alberto Cristina (left) and Marco Caleffi (right) shake hands on the acquisition of Cristina by Caleffi, parent company of Altecnic. Established near Stafford, Altecnic works closely with its manufacturing partner, Caleffi, to develop continually a diverse high quality, precision heating and plumbing product range that is always evolving in anticipation of new regulations and market trends. As a result, the company's products and servicesare chosen by trade merchants, original equipment manufacturers, plumbing and heating engineers and specifiers. The first business in its industry to be aCarbonNeutral® company, Altecnic is also proud to be ISO 9001:2008, ISO 14001:2004 and 18001:2007 certified.